Emergency Department (ED) overcrowding is becoming an increasingly international issue. Although the problem is not only resolved by ED change management (but rather requires a system-wide solution recognizing the complex interdependencies of consumer expectations, human resources, information systems immaturity and inadequate community care systems), effective utilization of scarce resources is a crucial component of emergency management and can directly influence the ability to treat casualties and save lives. Increasing ED length of stay (LOS) is associated with a host of negative consequences, including adverse clinical outcomes, ambulance diversions, patient dissatisfaction and stress on clinical personnel. Control of patient flow is an important facilitator. The vast majority of ED patients are walk-ins and many patients presenting in ED do not require urgent treatment. Assignment according to the level of urgency and expected fractile response time is mandatory. Combining the triage system with clinical pathways, including standing orders, can optimize quality care, risk management and LOS. Implementation of point-of-care testing during the process of triage leads to decreasing decision-making time and length of stay. Dramatic rates of increase in patient consultations in ED are not a phenomenon that is limited to Germany, rather a development that can be observed currently in all industrial nations. This tends to be a multi-factorial problem, in which changes to the healthcare policy framework conditions, patient socialization and demographic shift are key aspects. Long waiting times, overcrowded EDs, a lack of resources and medical mismanagement are not only being focused on by patients and the media; the subject is now becoming a political issue for governments, especially in the Anglo-American sphere. For example, the Reforming Emergency Care project was approved by the UK government in 2001 [1, 2]. Numerous quantitative and qualitative quality indicators now serve as a benchmark and, besides the recording of patient satisfaction, are considered as objective criteria for sufficient change management: e.g. a LOS of 4 hours or less for 98 % of all patients. Due to statutory quality reports, EDs are consequently being pressured into a rethink and restructure [3, 4]. Long waiting times not only lead to patient dissatisfaction, but also pose a potential medical risk; what is essential is the prompt identification of critically ill patients as well as further care in accordance with the guidelines and predefined quality criteria. A number of processes have been restructured at the ED of the Klinikum Frankfurt (Oder) in order to meet these requirements. The implementation of point of care (POC) in the triage process resulted in quicker clinical decision making and, as a partial result, a considerable reduction in LOS. The Klinikum Frankfurt (Oder) is a tertiary referral hospital with a nationwide trauma center, neuro-competence center and two cardiac catheterization laboratories. With over 24 subspecialties, all medical services are provided. The hospital has around 800 beds, and the emergency department has 30,000 patient contacts per year with an annual rate of progression of 7 %. The proportion of inpatients is 41 %. Incoming patients are subject to triage by nursing staff within 10 minutes (immediately for patients transported by the emergency services) in the form of a modified system consisting of the Manchester Triage System (MTS) and the Emergency Severity Index (ESI). These triage systems have been internationally validated and standardized. The level of care, selected from five categories, provides the first contact for physicians. Fifty percent of all patients in the emergency department of the Klinikum Frankfurt (Oder) are placed in the blue or green categories of the MTS. Therefore, only half of all patients are primarily considered as emergency patients with an urgent treatment priority. Seventy percent of all patients admit themselves, without having had prior contact with the emergency services or a referring physician. The ED is faced with the problem of identifying patients with a high level of risk in the shortest time and providing adequate treatment quickly. A modular, web-based, flexible and patient-oriented computer program, linked to the existing clinical information system (CIS), was developed in the central ED of the Klinikum Frankfurt (Oder) GmbH in order to fulfill the afore-mentioned requirements. The symptom-based, standardized and fully documented triage with subsequent patient control by means of integrated clinical treatment pathways, including laboratory-based diagnostic profiles, was implemented. The overview of the temporal, organizational process structures enables targeted process management. The resulting figures illustrate and support further process optimization in the emergency department. During triage, by means of the selection of the triage diagram, a link is already established to a clinical pathway that specifies the laboratory parameters for the presented symptoms of illness for the central laboratory and the POC. The blood samples taken during triage are analyzed at the POC setting immediately after collection, resulting in patient test results are available within a short period of time. Patients are presented with a symptom complex rather than a diagnosis. Both the priority of treatment and a diagnostic hypothesis according to differential diagnostic consideration must be determined on the basis of the symptoms within the shortest possible time. The difficulty and complexity of this process is illustrated with the example of the symptom "chest pain": The symptom "chest pain" conceals a variety of potential diseases, ranging from life-threatening aortic dissection, pulmonary artery embolism or an acute myocardial infarction to a rib blockage or shingles. The findings gained from the isolated clinical examination only present a piece of the overall "diagnosis" puzzle. Symptoms are gender-specific and age-related. The demographic development of numerous industrial nations is resulting in a clear increase in older patients with higher comorbidity and a limited medical history. In this respect, symptom-based diagnostic profiles are becoming increasingly important: The laboratory parameters that are decisive for diagnosis verification should be established within the shortest possible time. But which parameters are relevant to the decision-making process and what laboratory turnaround time (TAT), as a subcomponent of the whole "emergency" process, results in a shorter LOS? For example: The determination of a D-dimer to exclude thrombosis with a pretest probability (Wells score) greater than 2 provides neither a temporal nor diagnostic benefit: the patient must undergo a venous duplex investigation irrespective of a D-dimer value that is analyzed as negative. For the symptom "shortness of breath" it is not possible by clinical examination (e.g. auscultation) to distinguish to what extent an additional cardiac aspect (cardiac insufficiency, cardiac asthma) is present in addition to the purely pulmonary symptoms (asthma, exacerbated COPD). Asthma could be treated quickly, and the patient could be released for outpatient care within the shortest possible time. However, an untreated cardiac insufficiency requires further evaluation and inpatient admission. The sooner cardiac insufficiency is detected during the ED admission process, the quicker an appropriate therapeutic, diagnostic verification and admission/release decision can be made. In this example, the TAT of NT-proBNP is a key criterion for the quality of diagnostic care and the shortening of the total LOS. In particular with outsourced laboratory diagnostic units or laboratories that are decentralized from the ED, additional human resource requirements and a delay in the preanalytical phase must be taken into account due to sample transportation (unless a pneumatic delivery system is available). With a considerable reduction in personnel in laboratories, the analytical phase can also result in prolonged admission phases and analysis times. Sample preparation is an additional time-relevant factor in the central laboratory: Centrifugation results in a lengthening of the TAT in comparison with equivalent POC testing procedures. The release of the values, their registration and the resulting diagnostic implementation play a key role in the postanalytical phase: Many CIS lack a laboratory release display function. Telephone calls often have to be made to the laboratory or the values are called up with a delay as the values have not been released. In particular in the event of high levels of patient admissions and limited personnel resources, this issue can lead to considerable delays in the decision-making process and, ultimately, to a lengthening of the total LOS. If, for example, the TAT of a cardiac marker is considerably above 60 minutes because of sample transportation, decentralized sample collection, sample preparation and release, this consequently results in a delay in the initiation of anti-ischemic treatment and the transfer to the appropriate care unit (chest pain unit, IMC, cardiac catheter unit). Time requirements for the laboratory analysis time are shown in the certification requirements and guidelines of the specialist associations [5, 6]. The central starting point for all emergency patients in the Klinikum Frankfurt (Oder) ED is a standardized, symptom-based 5-point triage process. A default symptom diagram (e.g. chest pain, shortness of breath) is assigned to the patient by means of the standardized triage system. Vital parameters are measured and documented in the system at the same time. A laboratory profile is assigned to the symptom diagram by means of the integrated clinical path specification. A blood sample is taken during the triage process. 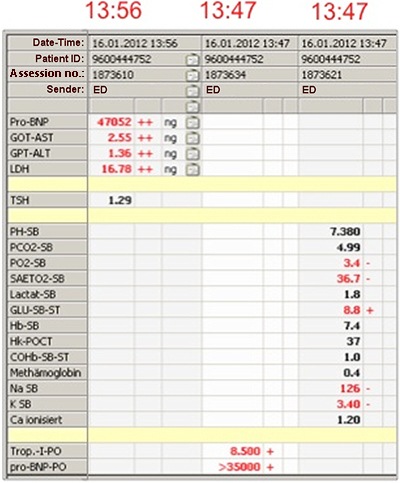 Due to the use of POC technology, by means of blood gas analyses, numerous parameters (partial pressures, base excess, hemoglobin, hematocrit, lactate, glucose, electrolytes, pH, creatinine, dyshemoglobins) corresponding to the triage symptoms and the clinical pathway specification are already available within 2 minutes and within 20 minutes for cardiac symptoms (troponin, NT-proBNP). The prompt detection of myocardial necrosis via troponins plays an important role, particular in the context of cardiac diagnostics, both in the therapeutic and organizational procedure. Whereas the availability of cardiac laboratory parameters plays a secondary role if clear electrocardiographic signs of a myocardial infarction (ST-elevation myocardial infarction (STEMI)) are present, patients are immediately sent for catheter diagnostics. The troponin evaluation is initially paramount for patients with chest pain symptoms and primarily no electrocardiographic signs of an STEMI. Patients with a positive troponin result receive specific anti-ischemic treatment and are referred to the appropriate care unit (cardiac monitoring station, cardiac catheter unit) according to their risk scoring (e.g. GRACE score) in accordance with the guidelines . Patients with chest pain and no significant increase in troponin value or ischemic-related electrocardiographic changes are monitored in the chest pain unit for 6 to 12 hours, assessed and released for outpatient care. In 2008 POC diagnostics was implemented in order to reduce the TAT of the troponin parameter from 90 minutes. As a result of the omission of sample transportation to the central laboratory, the reduced analysis time and the POC parameter release being visible in the IT system, a significant reduction in TAT from 90 to 25 minutes was achieved. Of 18,377 patients at the ED in the Klinikum Frankfurt (Oder) (Fig.3), a POC troponin determination was carried out for 14 % according to the symptom-based clinical pathway specification. A positive troponin result was observed in 23 % of all patients with chest pain, and 48 % of these patients had a positive cardiac catheter result. A positive troponin result was observed in 9 % of all patients with discomfort, positive cardiac catheter diagnostic findings were recorded in 30 %. Only 1.8 % of patients with the symptom of upper abdominal pain had a positive troponin result. Shortness of breath correlated with a positive troponin result in 17 % of patients. Twenty-one percent of these patients had a pathological correlation in the cardiac catheter unit. Consequently, the "discomfort" diagram can be a valuable indicator for an acute case, particularly in older patients . FIG. 3: Distribution of symptom-based clinical pathway with or without elevated troponin in ED. A 73-year-old patient was referred by a family physician, with a tentative diagnosis of a gastrointestinal infection. Hypotensive blood pressures had been observed under hypertensive medication. The patient had been feeling adynamic for 3 days and complained of vomiting and nausea. Norovirus diseases had been recorded in the surrounding area. In the triage process according to the MTS, the patient was assigned the "discomfort" symptom diagram. Diarrhea was not described. The default laboratory profile specified, among other things, POC troponin I, NT-proBNP and a blood gas analysis (blood gases, lactate, Hb, Na, K, glucose), (Fig.4). The analysis for the POC troponin determination and the blood gas analysis were started at 13:47 - the results of the blood gas analysis were available at 13:49, and the troponin value was available at 14:07. The determination of the parameters began in the central laboratory at 13:56 (sample transportation and collection), and the results were released at 14:36. Due to the patient's troponin value, which was considerably higher than the cut-off value, as well as the considerably increased NT-proBNP, the disease, which had initially been classified as gastroenteritis, was revealed to be cardiogenic shock within 20 minutes of the patient being admitted, thanks to POC. 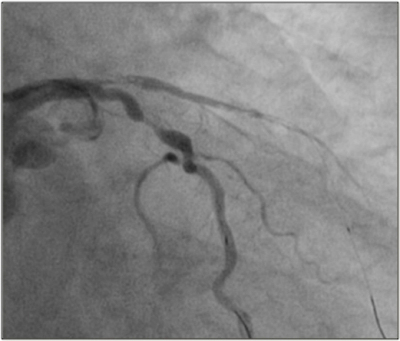 The patient immediately received appropriate cardiac treatment. FIG. 5a: Procedure without POC. FIG. 5b: Procedure with triage + POCT. Prior to establishing the procedure described above (Fig.5a + 5b), the patient would have been perceived as a gastroenteritis patient, not as an at-risk patient, the troponin test would not necessarily have been carried out, and the patient may even have been incorrectly sent on to a subspecialist unit (gastroenterology) as a gastroenteritis patient with volume depletion. The partially implemented "first-view concept", carried out by a physician immediately as the patient is admitted, would not have had any benefit for the patient without the rapid availability of laboratory parameters. The clinical pathway specification with appropriate laboratory specifications optimizes medical personnel requirements. In the Klinikum Frankfurt (Oder), the integration of POC into a system-based triage system linked with clinical pathways as well as several changes in process management have led to a reduction in the average LOS. From 2.3 hours to 1.8 hours in the period from 2008 to 2011. Irrelevant parameters are not collected, and relevant parameters are not forgotten, irrespective of the level of experience of the medical and care personnel. Banerjee A, Mbamalu D, Hinchley G. The impact of process and re-engineering on patient throughput in emergency departments in the UK. Int J Emerg Med. 2008; 1: 189-92. Flinders Medical Center 2003 Australia Redesigning Hospital Care; the Joint Commission, sentinel event alert: Delays in treatment. 2002. Connar RE, Brady W, Brooks SC, et al. Part 10: Acute Coronary Syndromes: 2010 American Heart Association Guidelines for Cardiopulmonary Resuscitation and Emergency Cardiovascular Care. Circulation. 2010; 122: S787-S817. Author 2nd Poster Prize, Capital City Conference of the DGAI, Berlin 2012.